Our pour over coffee filter cone is of true luxury quality and engineered to give you a perfectly brewed cup of coffee with each and every use. Our laser cut 18/8 stainless steel mesh features an ultra fine weave, that allows flavorful coffee to pass through but keeps all the grounds contained. Never buy or discard another coffee filter again. Our Permanent coffee filter not only eliminates paper waste, but it also ensures that all of the nutrients and natural flavor oils from your coffee end up in your cup-not trapped in paper. After brewing, simply rinse well with warm water or throw it into the dishwasher. Brewing fresh coffee with our pour over coffee dripper couldn't be easier. 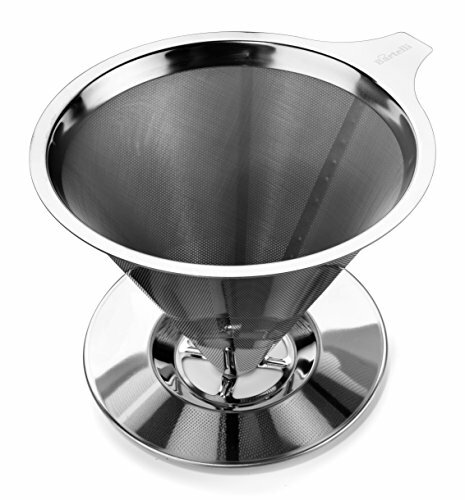 Simply place the stainless steel coffee dripper on top of your cup or mug and add 2 tablespoons of freshly ground coffee into the filter for each 6 ounces cup of coffee you are making. Then, pour 1 ounce of boiling water over the fresh grounds. Wait a few seconds for grounds to expand and then slowly add the rest of the water, pouring in a circular motion. You'll have fresh, tasty coffee ready to sip in no time! Manufactured from premium 18/8 food grade stainless steel. Featuring superior durability, stain resistance, corrosion proof, and rust proof. If you have any questions about this product by Bartelli, contact us by completing and submitting the form below. If you are looking for a specif part number, please include it with your message.